A bionic eye implant that could possibly help to restore the sight of millions of blind people could be available to patients within two years. US researchers have been given the go-ahead to implant the prototype device in 50 to 75 patients. “What we are trying to do is take real-time images from a camera and convert them into tiny electrical pulses that would jump-start the otherwise blind eye and allow patients to see,” said Professor Mark Humayun, from the University of Southern California. About 1.5 million people worldwide have retinitis pigmentosa, and one in 10 people over the age of 55 have age-related macular degeneration. Both diseases cause the retinal cells which process light at the back of the eye to gradually die. 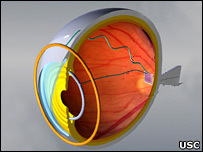 The new devices work by implanting an array of tiny electrodes into the back of the retina. A camera is used to capture pictures, and a processing unit, about the size of a small handheld computer and worn on a belt, converts the visual information into electrical signals. These are then sent back to the glasses and wirelessly on to a receiver just under the surface of the front of the eye, which in turn feeds them to the electrodes at the rear. First-generation, low-resolution devices have already been fitted to six patients. “The longest device has been in for five years,” said Professor Humayun. Terry Byland, 58, from California was fitted with an implant in 2004 after going blind with retinitis pigmentosa in 1993. “At the beginning, it was like seeing assembled dots – now it’s much more than that,” he said. Mr Byland is also able to make out other shapes. “I can’t recognise faces, but I can see them like a dark shadow,” he said. The new implant has a higher resolution than the earlier devices, with 60 electrodes. It is also a lot smaller, about one square millimetre, which reduces the amount of surgery that needs to be done to implant the device. The technology has now been given the go-ahead by the US Food and Drug Administration to be used in an exploratory patient trial. This will take place at five centres across America over two years, with 50-75 patients aged over 50. If successful, the device could be commercialised soon after, costing around $30,000 (Â£15,000). Other devices could then be developed with higher resolution or a wider field of view, said Professor Humayun. Future work includes studying the effects the implants have on the brain. “We are actually studying what happens to the visual cortex over time,” said Professor Humayun. The research was presented at the American Association for the Advancement of Science (AAAS) annual meeting in San Francisco, US. This entry was posted on Saturday, February 17th, 2007 at 8:34 pm	and is filed under Blogging, News, Science. You can follow any responses to this entry through the RSS 2.0 feed. You can leave a response, or trackback from your own site.